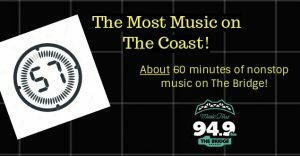 Most of the radio stations on the coast get their programming (music AND personalities) from some national service thousands of miles away. These satellite services stop the music A LOT for stations to drop in commercials. 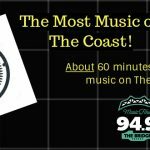 At 94-9 The Bridge, we produce almost all of our programming and music right here on the North Coast. We have full control of when we stop the music (and we don’t like doing it much!). In fact, much of the time, we’re sweeping through ABOUT 60 minutes of nonstop music!